Established in 2004 by Canadian Romantic Realism artist Chris MacClure, today’s holiday celebrates artists working in all mediums from painting to sculpture, photography to music, writing to dance, and many more. Creative expression is a universal language, and society benefits when art and artists of all types are embraced and celebrated. The goal of International Artists Day is to celebrate the contributions of artists and to raise their stature and visibility around the world. A love of the arts can start at the youngest ages by exposing children—and even babies—to a variety of creative mediums and allowing them to explore their talents. For more information about International Artists Day, visit the IAD website. Don’t be surprised if you feel a flutter of the heart upon opening the cover of My Art Book of Love. Page after page of gloriously reproduced paintings from thirty-four artists from the past and working today demonstrate love in all of its actions, forms, colors, and meanings. Divided into six sections, the paintings touch on what love is, how love feels, what love looks like, and other qualities of this tender emotion. Courtesy of Phaidon Publishing, copyright 2018. Accompanying each painting is a lyrical phrase that describes its feeling or subject and combines with the others in the section to create a moving verse that will warm the hearts of little ones—and even older children. To begin, “Love is… soft snuggles…” represented by a detail from Gustav Klimt’s The Three Ages of Woman, in which a mother and child sleep cuddled together with the mother resting her head on her child’s soft curls. Love is also “tender nuzzles,” and any animal lover or child with a pet will recognize the shared affection as a little girl strokes her pet in Pierre Bonnard’s Little Girl with Cat. The comfort an older sister provides for her younger sibling tugs at the heart in Paul Gauguin’s Piti Teina (Two Sisters), and Alan Katz demonstrates that growing up with a bunch of sisters can be an adventure in The Ryan Sisters, in which four girls walk down the road barefoot with their arms around each other. As an African-American boy wears his dad’s fedora while getting a big hug in Emory Douglas’s Father and Son, “Love feels… Safe.” A father’s encouragement can make a little one feel “brave” as in Vincent Van Gogh’s First Steps, after Millet, where a father spreads his arms to welcome a baby toddling his way. In all the ways it is expressed, “Love is Beautiful.” Salvador Dali captured the joy a father feels for his child in Fiesta at the Hermitage, a fragment of which spotlights a father playfully lifting his infant above his head. Henry Moore’s sculpture Family Group lets children visually experience the solidarity of the family unit as a mother, father, and two children are connected through touch. Two vibrant and familiar artworks close out this poignant tribute and remind readers that “Love is for everyone!” as the linked figures dancing around a red heart in Keith Haring’s untitled painting and the bold and boxed letters L-O-V-E in Robert Indiana’s Philadelphia Love beautifully demonstrate. Back matter presents thumbnail images of each art piece along with information on the artist, the work, and which museum it can be found in. Exquisitely curated to offer a range of artistic styles, cultural touchstones, and emotional responses, My Art Book of Love is a sophisticated board book that is part museum, part love letter and a completely original and moving way to share and talk about love with babies, toddlers and older kids during quiet, cuddly story times. The book can also be used in classrooms to accompany reading, writing, and art lessons. The book makes an inspired choice as a gift or to add to any home, classroom, and public library. Bare wooden blocks can provide lots of artistic fun for both young and older kids. Painted with craft paint or chalk board paint, they can be written on or drawn on with chalk. They can be stacked to make sentences or towers or sculptures. Connected with glue or adhesive Velcro tape, blocks can become a robot or a giraffe, laid end-to-end they can be a train or a snake. Supply some cloth, play jewels, googly eyes, foam shapes, glitter, or other items and let kids play with their imagination and creativity! Established in 1986 by the International Union of Architects, World Architecture Day is celebrated on the first Monday in October to coincide with the United Nations-sponsored World Habitat Day. Each year a different theme highlights the important aspects of architecture in our lives. This year’s theme is “Architecture…for a Better World” and emphasizes the issues, challenges, and rewards of housing the world’s citizens. To celebrate today take a walk around your town or city with your kids and study the buildings and how they fit into history or new construction in your area. You can also research a famous building and the architect who designed it! When Brick was a baby, she marveled at all the tall buildings and “wondered how anything could grow so big.” Her mother told her that “‘great things begin with small bricks.’” And Brick saw that it was true. When she looked closely, she saw that all the buildings she admired were made of bricks just like her. Brick wondered if there were buildings like this in all towns and even in other countries. Image copyright Julia Rothman, 2018, text copyright Joshua David Stein, 2018. Courtesy of Phaidon Press. She saw churches, mosques, synagogues, and a Buddhist temple. She thought they were beautiful, “but they did not call out to her. And so she kept going.” She walked on walls and looked down both sides, but she did not want to divide places and people, so she kept going. She visited apartment houses, houses in the suburbs, and even a country house with a “chimney billowing smoke.” But Brick knew that “homes eventually empty and hearths grow cold.” This was not the future she wanted. Where did she belong? Brick wondered. Brick considered all the buildings she had seen, and she remembered the words her mother had told her long ago about great things. She sat at the end of her path and pondered into the night. When the sun rose, Brick saw the answer right in front of her. She settled herself in and “became part of a wide and lovely path” that would guide other bricks to find where they belonged too. An Afterword presents a description, complete with photograph, of the various buildings Brick encounters in her travels. Full of lovely metaphors and deeply considered thoughts on the way architecture models the human heart as well as how people design their buildings and structures for purposes both positive and negative, Joshua David Stein’s story is a unique look at growing up. The brick makes a particularly compelling character, for in any building each brick holds a crucial place in the design while also joining with others to create a durable whole—just as it is for any individual in a strong, vibrant community. As the little brick is exposed to the various roles she could dedicate her life to, she thinks not only of the immediate reward of “having a job” but of what her philosophies are and what she wants her future to be. In a perhaps surprising—but welcome—choice, Brick decides that instead of being part of a grand edifice, becoming a step along the path and guiding others is her calling. This recognition of teachers, parents, caregivers, and other such role models is inspired and uplifting. Julia Rothman’s light touch, variety of reds, and whimsical black-and-white line drawings of foliage, ancillary elements, and toy-strewn backyards beautifully showcase a world of sturdy brick buildings while giving readers a sense of the soaring awe with which Brick views her city and the landmarks she visits. Rothman’s use of perspective juxtaposes tiny Brick against towering structures mirroring a feeling that young readers may know well. The path Brick travels is ever-present, running from edge to edge of the pages. The final two-page spread of Brick happily fitted into a path that meanders through a lushly landscaped park, which is being crossed by a young brick on his way to the city in the distance will delight readers. Brick, Who Found Herself in Architecture is an original and lyrical look at individuality, growing up, and finding one’s place in the world. The book would be a strong addition to school, classroom, and public libraries and an encouraging and reassuring choice for home bookshelves as well. To learn more about Julia Rothman, her books and her art, visit her website. Sometimes it’s good for kids to remind themselves of all the things that they like, stops along their path, and even words that describe them. With this craft, kids can make a “brick” that stands strong with all of their unique qualities. While a wooden block can be used to make a brick, if you have a real brick that can be used too! Write words about yourself, things you like to do, inspirational places you’ve been, even places and things you’d like to do in the future. As a story extension for the classroom, cut one brick-sized rectangle from red construction paper, heavy-stock paper, or poster board for each student. Have them write about themselves, about what they think they would like to do in the future, or about some other topic pertinent to your class. Let students display their bricks by working together to “build” their own path in the classroom. As the weather turns cooler and eventually cold, hot drinks become a favorite for their warming properties and the cozy feeling they give inside. Hot Mulled Cider adds a festive touch to parties, dinners, or just sitting by the fire. The drink is made by heating apple cider until it’s nearly boiling and then simmering with adding spices, such as cinnamon, nutmeg, and cloves, as well as orange peel or other fruits. One sip will tell you that the apple-picking season of autumn has come and remind you that winter is on its way. As you rake up fallen leaves when autumn turns them from green to vibrant reds, yellows, and oranges and the wind plucks them from the trees, you know that with each swipe nature may present a little treasure. A Pile of Leaves is just as surprising, as page after page reveals deeper and deeper layers that hide colors, life, and even forgotten or lost items. Copyright Jason Fulford and Tamara Shopsin, 2018. Courtesy of Phaidon Press. Clever transparent pages are rimmed in bold fall colors and painted with cottonwood, oak, maple, birch, ash, and other types of leaves. In their placement they hide something that becomes visible only with the turn of the page. The final little discovery will cause readers to smile in appreciation for the realism in this artistic look at a highlight of autumn. The fresh and creative design of this board book will keep young readers enthralled as they ask again and again to see what’s underneath each leaf. The book is a wonderful way to inspire nature walks with children and to excite them to explore leaf piles and other seasonal changes in their own backyard. An illustrated key in the back of the book tells the names of the leaves, insects, and other objects found on the pages. To learn more about Jason Fulford and his books, visit his website. Discover more about Tamara Shopsin, her books, and her art on her website. Little ones are naturally creative, and with a variety of paints, your child will have fun mixing colors and making their own fall flowers and trees. On a hot, steamy day, there’s nothing like a popsicle to refresh you! While today’s holiday celebrates the cherry-flavored pop, there are lots of other flavors and combos of flavors to enjoy as well. Like many food innovations, the popsicle has an interesting backstory. It seems that in 1905 when Frank Epperson of San Francisco was 11 years old, he was mixing up a batch of soda on his porch. He left the stirring stick in it overnight. That night the temperatures dropped to freezing, and when Frank came out in the morning, he discovered a new taste sensation. He went on to experiment with fruit flavors. He introduced the first popsicle in 1922 at a fireman’s ball. The treat was a huge success. In 1924, Frank applied for a patent for his “Epsicle.” He later renamed it the popsicle. Today, enjoy your favorite flavor popsicle—nature’s version is coming soon enough! With only one line, Bastien Contraire sends young readers off on a scavenger hunt to find the interloper among the images. “One of these things is almost like the others…,” he prompts, while a page containing three fruits—a red pear with a green stem, a green apple with a red stem, and a lime with a little red end—share space with a red-and-green beach ball. Pretty tricky! Copyright Bastien Contraire, 2018, courtesy of Phaidon Press. Turning the page, the hunt gets a little more difficult as there are six candies to search through—or is it five? Hmmm…. The next spread is trickier still with red-and-green vegetables, plus one brown eggplant vying for attention. Wait? Is that red-and-green frilly thing really a veggie? All these decisions can make a reader hungry! Fortunately, you can eat up the next puzzle that’s a delicious lineup of popsicles and ice-cream treats and one… do you see it? The next few pages offer fruit, bottles, mushrooms, and an array of sandwiches that are all sheltering one misfit in their midst. Kids will say yum at the variety of desserts they encounter later in the book while quacking up at the odd one out who does a good job of hiding among the pastry. It may take a bit of looking to find the imposter in the deli, and by the end of the book, little ones will surely be able to signal which object doesn’t belong among the cans and jars. Bastien Contraire’s series of Hide and Sneak board books are great fun for little readers who love to use their powers of deduction and categorization to solve the puzzles. In his stylized, stenciled images, Contraire cleverly uses red, green, and brown tones as well as the positioning of the items to disguise the outlier just enough to make the hunt challenging. Contraire also adds sly humor to the quest as the nonconformist often has some kind of connection to the other items—a similarity or association that’s fun for readers to discuss. Enjoyably challenging for young readers, Food Hide and Sneak is an entertaining addition to home, preschool, and kindergarten libraries. Discover more about Bastien Contraire, his books, and his art on his website. Here’s an easy-to-make game for little ones that will challenge their powers of observation while they’re having fun! Get Caught Reading Month was established in 1999 by the Association of American Publishers to encourage people of all ages to read more. Authors, illustrators, celebrities, athletes, and others participate by sharing pictures of themselves reading an old favorite or new book on social media. Schools, libraries, bookstores, and community venues hold special programs throughout the month. For more information and to find resources, visit the Get Caught Reading website. Copyright Sara Gillingham, 2018, courtesy of Phaidon. Readers also learn about Car Carriers, Ferries, Oil Tankers, Police Boats, Rescue Boats, and Diving Boats. Each boat also flies a maritime flag so that children can learn which ones mean yes and no, signal left and right turns, warn of fishing nets or divers in the water, direct others to stop and listen, say Hello, warn of dangerous cargo, indicate the boat is not moving, signal reversing, tell other boats to stop, and tells that the boat will soon be leaving port. Sara Gillingham’s welcoming and conversational descriptions will excite kids who love modes of transportation and/or the sea as they learn a few facts about each boat. Her engaging rhythm and well-chosen vocabulary will appeal to a wide range of readers. The text elevates her target audience, understanding toddlers’ and preschoolers’ thirst for learning. After reading Boats Are Busy, kids are sure to happily recognize different boats and be able to recount their new knowledge. Gillingham’s boldly colored pages spotlight each boat with realistic details that clearly show young readers its shape and purpose. Crew members and passengers working and enjoying each vessel also demonstrate the scale of the boats. Docking Boats Are Busy on home or classroom bookshelves will delight little ones. This sturdy board book also makes a terrific take-along for the beach and other outings. The ships below need help. 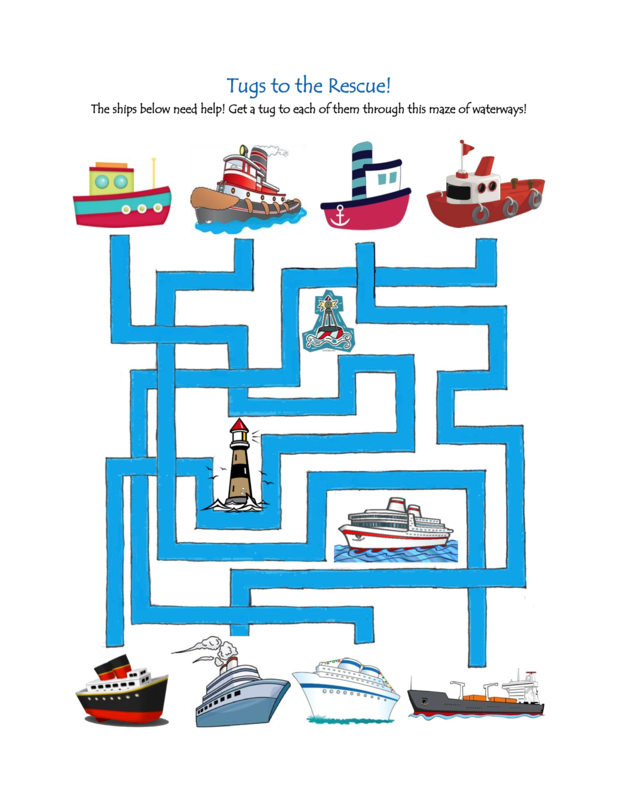 Match each tug to a ship in this printable Tugs to the Rescue! Matching Puzzle?